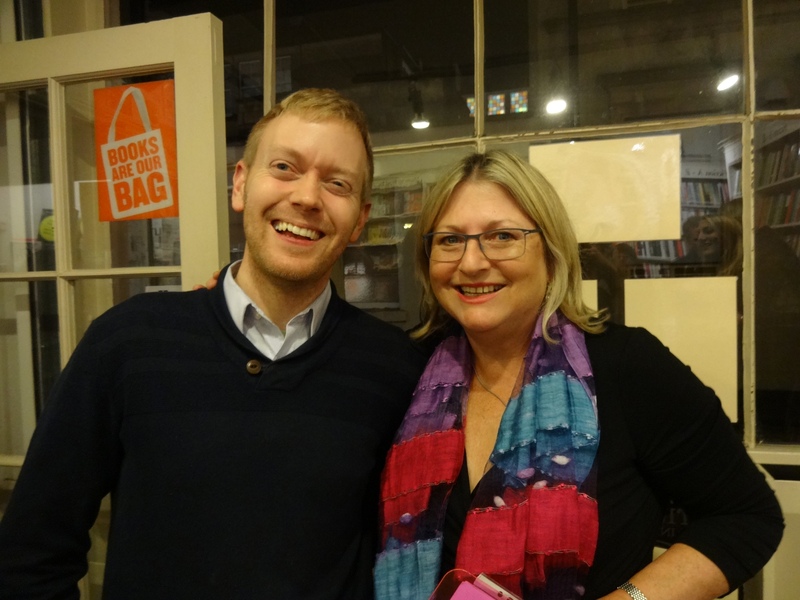 Nic, Mr B himself, with Jane. 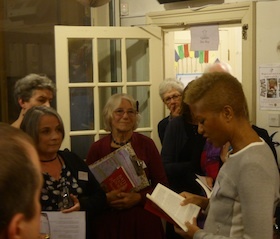 We were thrilled that ten of the twenty authors in the anthology were able to come along to read short extracts from their stories to a packed house of partners, friends and short-story-loving guests. 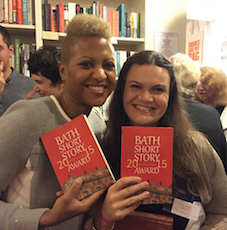 Two of the authors, Sara Collins and Emily Devane are pictured on the left. It was a fabulous evening. All the authors who attended read brilliantly from the beginning of their stories and left listeners longing to find out what happened next. 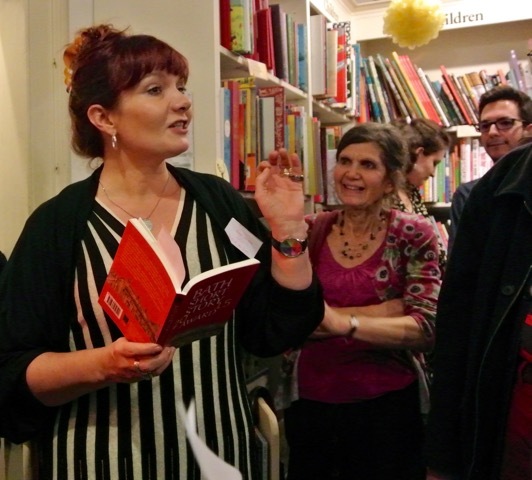 Here you can see Jude, Anna and others, spellbound by Sara Collins reading her story. 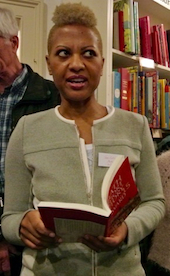 Our first prize winner, Safia Moore, was unable to attend as she lives in the United Arab Emirates. 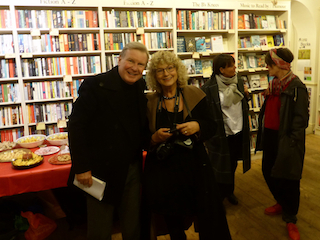 After Anna’s introduction and thanks to all, Jane’s friend Jerry pictured here on the right with Sue, who took a lot of the photographs, started off the readings with an extract from Safia’s story, ‘That Summer.’ Click on video clip to see Jerry reading some ofthat extract. The recording starts a few seconds into the reading. 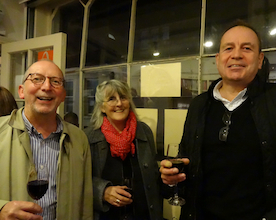 Gary and Douglas from The Self Publishing Partnership who published our high quality book under their Brown Dog imprint, came along and here they are with Alexandra Wilson, from Writing Events Bath, who in 2015 sponsored the Acorn Award for an unpublished writer, this year won by Lucy Corkhill with her story.’Last Rites’. Our anthology cover was again designed by the very talented artist and writer Elinor Nash who unfortunately wasn’t able to come along. We sold all the books pictured here during the evening. 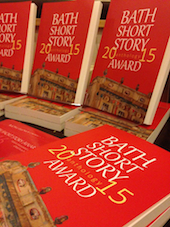 People love the colour of the anthology this year – many saying how festive it is – just right for Christmas presents. 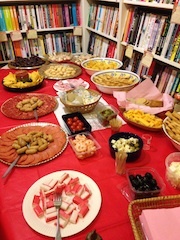 In between batches of readings, there was time for people to mingle, chat, buy books drink wine and eat ‘nibbles’. 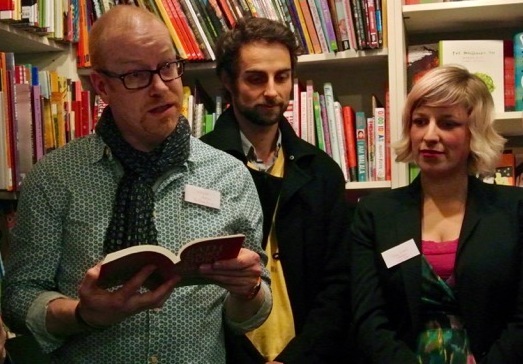 On this post, we’ve pictures of all the authors reading, plus the first few lines of their stories to inspire you to buy the anthology – available from this website, Mr B’s, The Big Green Bookshop, London and via Amazon in digital as well as print format. 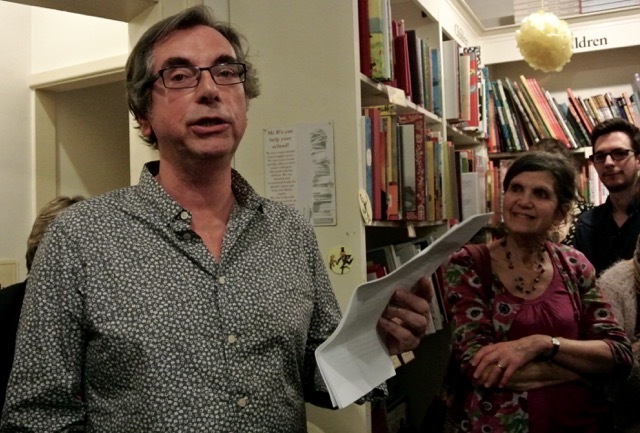 To the right, there’s a picture of K M Elkes our local prize winner reading from his story, ‘The Three Kings’. “It was Friday night, our wages were paid – we were set for the dance down Kilburnie. 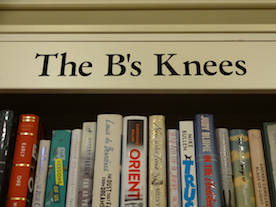 There were three of us – me, Frances and Robbie – living cheap over McAdams the butchers where a yellow stink of fat pooled at the bottom of the stairs”. 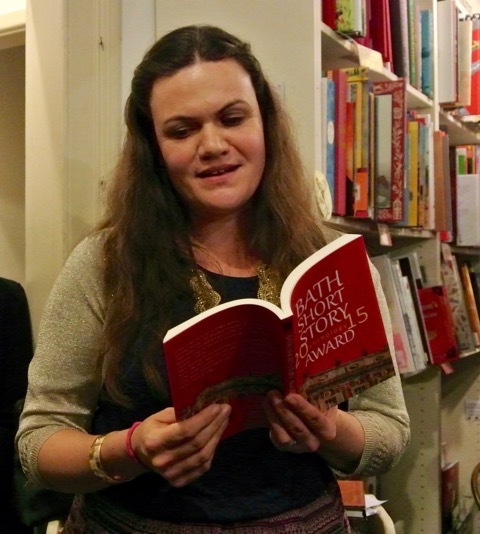 Lucy Corkhill, winner of the Acorn Award for an unpublished writer of fiction reading from the beginning of her story ‘Last Rites’. 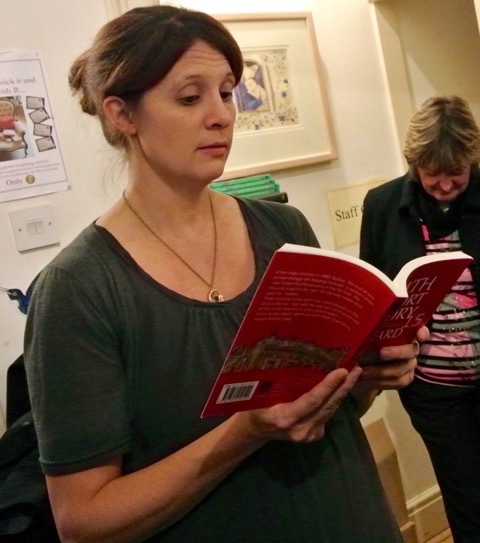 Click here to see a Youtube video clip of Lucy reading the extract. She also tells us how she entered the competition at 11.47 pm on the last day! Sara Collins reading from her shortlisted story, ‘Lilith’. Emma Seaman reading from her shortlisted story, ‘The Ends of the Earth’. 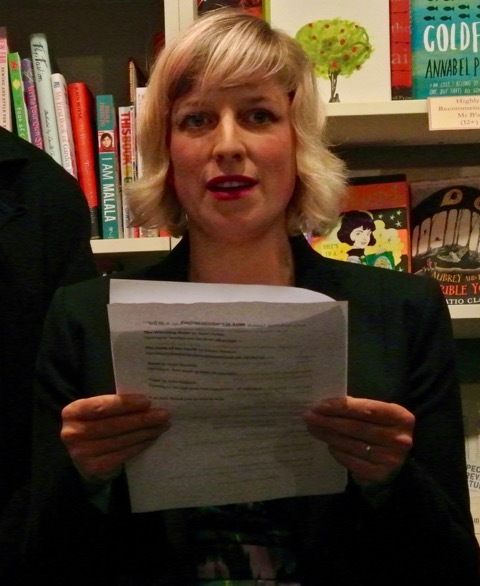 Watch a video clip of Emma reading the extract. Emily Devane reading from her story ‘Ruby Shoesmith, click, click,click’. Click here to listen and watch a video clip of this extract (starts a few seconds in to Emily’s reading). ‘Your first word is ample.’ Mrs Barker paces between the desks. ‘Ample’ she says again, stressing the ‘p’ sound so that her chest heaves forward unsettling the chain that carries her glasses. 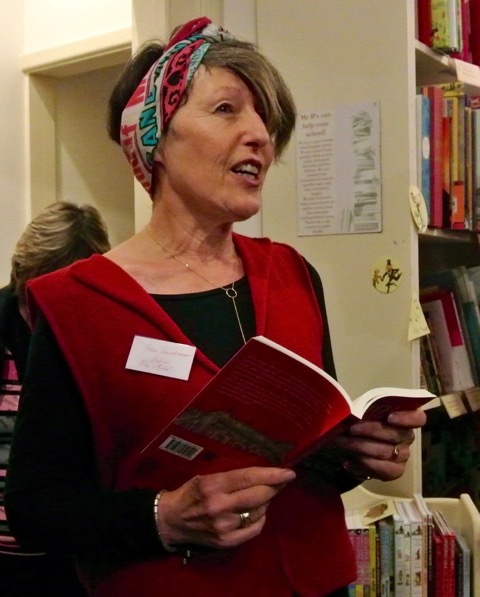 Anne Corlett reading and extract from her story, ‘The Witching Hour’. Click here to watch a Youtube video clip (starts a couple of seconds into Anne’s reading). “I discover we have a witch on the first night in the new house. 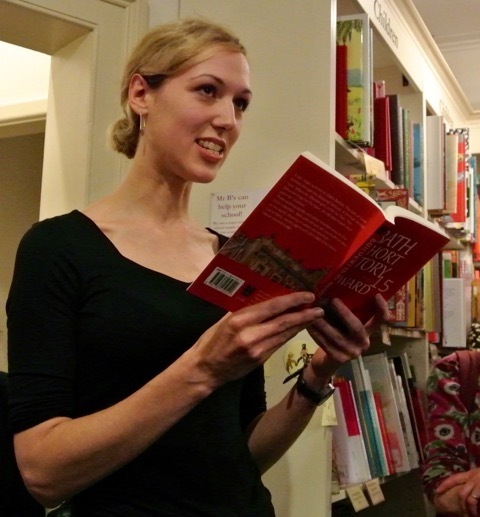 Anna Metcalfe reading an extract from her story, ‘Sand’. Listen and watch Anna reading it here. We missed recording the first few seconds but it sounds great. 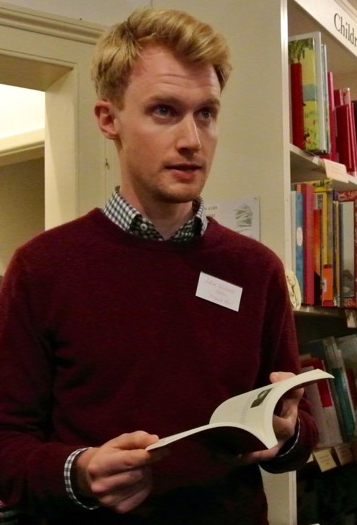 Adam Kurcharksi reading from his story, ‘Mosquito Press’. Click to hear a video clip of some of his story. The clip starts a few seconds in to the reading. Fran Landsman reading an extract from her story, ‘Big and Brie’. Click here to listen to a Youtube video clip It begins a couple of seconds into the story. Ten very different compelling stories and ten more to read in the anthology. All of those wonderful too. The authors who weren’t able to attend, apart from our winner Safia Moore, were second prize winner, Dan Powell, third prize winner, Angela Readman, commended, Eileen Merriman, commended, Barbara Weeks, shortlisted,Sophie Hampton and Alice Falconer, Fiona Mitchell, Chris Edwards-Pritchard, and Debbi Voisey.